When going to your first festival, it's harder than it seems to know exactly what to take with you; what you think may be convenient, logical and suitable, may lead to regret when having to lug a two ton bag from the drop off point to the camping area (this is always a lot further than it seems). It's fairly essential to know what to bring, and even more crucial to know what not to bring. · Pain killers – chances are you'll need them! · Sunglasses - at least if you forget your makeup no one will know. · A disposable camera - don't bring your £600 camera, take a disposable with you! · The onesie - when you stop caring about what you're wearing, the onesie is perfect, and warm for the night! · Expensive phones - massive no-go! You're likely to end up losing it, breaking it, or selling it at 3am, so bring a brick with a spare pay-as-you-go sim in it. · Designer clothes - it's not a fashion competition, look good but don't risk ruining your expensive kit! · Anything that will go off - bring canned or processed food or buy it if you have to; don't take milk and butter with you, it will go rank in the heat! · Chocolate - I know it's nice to have, but it will melt and be disgusting. · Excessive amounts of clothes - you may think you need to plan every outfit according to who you're seeing and what day it is, but you don't: you will end up not caring and questioning why you brought all that extra baggage. Pitching your tent in the right place is the most important thing you can do; it's your home for the next few days. Logically, it's not advisable to pitch it on the outskirts of the camping area as you could get lost late at night, and it will feel like a mission to walk to by the end of the weekend. However, you don't want to pitch your tent right by the entrance of the main arena, as there will be crowds of drunk people who will have no consideration whatsoever of the fact that you're trying to sleep at 4am, trudging past loudly and tripping over your guy ropes. The best bet is to pitch near enough to the entrance to the main arena that you don't have to walk miles to get there, but not so close that people are still pouring past in hordes and liable to wake you up if you're not already awake. Putting your tent up is the main priority upon arrival; aim to get it done as soon as humanely possible. 1. Truck - a small festival of about 3-5000 'truckers'. 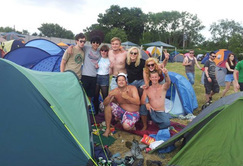 Often a great line up for indie music lovers, Truck festival offers three stages, and great camping, taking place in Oxfordshire. 2. Redfest - sponsored last year by 'hype' with Bastille headlining, this festival is going places! Held in Surrey. 3. Reading - if you like big festivals with big names headlining, this is perfect. 4. Womad - hippy festival of the year! Think dreadlocks, tie dye and other hippy connotations. It's great for music and nature lovers. 5. Watchet - situated in a seaside town in Somerset, this festival is great for families with teenage kids! If you're a cider and seaside lover, this is a great option. 6. Elderflower fields - this is a festival ideal for families with young kids, situated near Lewes and ideal for small children and young parents who love nature. 7. Glastonbury - obvious choice for some, huge festival with massive headliners and loads of stages for all music genres. If you like busy, packed festivals with a great vibe, it's an advisable option. 8. Download - with Slipknot headlining last year, it's great if you're a mosher or a rocker. Think loud music, Mohawks and thrashing heads. Don't feel like you shouldn't enjoy yourself with your mates whilst struggling with your tent, just don't let it get to 10pm and be surrounded by friends and food and drink but no tent. If there's just you and another person going, invest in a two-man pop-up tent - although they can be a real struggle to disassemble on the morning of the last day. Think wisely about managing pop-ups. You might feel it necessary to do a practice run a few days before you leave run if the tent's new, just to try to avoid looking like a total idiot as you wrestle with it among the wreckage on the final day. The importance of remembering a rain coat and wellies cannot be stressed enough. You can buy water proof ponchos for about a quid in any high street shop, and they are ideal for a festival: cheap, light weight and easily accessible. You never know when the heavens will open and pour down several tons of rainwater onto your festival weekend, so expect the unexpected. If you're camping with a group and you go to the main arena and some stay behind, don't forget to shut your tent. I'm not suggesting they'll steal from you, but you never know, if it starts raining, they might not remember to zip up your tent, so you can say goodbye to the iPhone you knew you should never have brought with you. The importance of wellies should be obvious - you'd have to be a real rookie to camp in England and not bring protective footwear. If you're fashion conscious, Doc Martins work as an alternative, as they'll protect your feet and be a lot comfier than wellies. But nevertheless, some form of protective footwear is essential. Nobody wants trench foot, and you have to remember it's just you and nature when you're camping; it is going to cause serious discomfort if you step into knee-deep mud bare foot or in your brand new Vans. So, don’t forget to be prepared- even if it's predicted to be 35 degrees celsius the entire weekend. If it is predicted to be a heatwave, then you need to prepare for that as well. It would be illogical to not bring sun cream with you, and it is colossally important not to forget it. This isn't a safety nag about the condition of your skin, this is a warning that partying hard and heat stroke do not mix in any sense; dehydration plus dehydration - you do the maths. If you neglect to pack this prestigious item you will regret it...the onesie. There's nothing more comfortable than partying in a onesie. Forget designer short shorts and a crop top when seeing your favourite band! Think onesie. The unspoken truth is, anyone can be awesome when wearing a onesie and they are the ultimate comfort. This way, you won't freeze to death at night. Believe me, when you see a group of people all in their onesies, you will regret not bringing yours. Animal onesies are the best; people love tiger onesies in particular. So, remember to pack your onesie, because they're the best outfits for any type of festival.